How Many Years Have You Been a “Future” Published Author? There’s a cure … and it begins RIGHT NOW! Yes, I know. Writing a book seems like a huge project., too much work, not enough time and who knows what it will get you anyway. It's so easy to put off starting until tomorrow and as we all know, tomorrow never comes. And neither does the book. If you're like most people, you've written a few articles, put out an ezine, maybe even started a blog, just like the gurus tell you to do, but write a book? No. Most of it is random, not systematic, not planned. It's more like, "I've gotta get a newsletter out today." So you toss in whatever you think of in the moment. That book? It's way beyond reach, still stuck in your head. You read my stuff and everyone else's, telling you to write that book, organize your articles, blogs, videos, and newsletters but nothing happens. It's just too much. For decades I too was a future published author. I wrote the first page of my first novel when I was still in college. Twenty years later I still had only the first page. I asked myself, "Where did all that time go? Where were all those tomorrows when that book was supposed to get written? What went wrong?" Fast forward to today. I've written and published six books. I've co-authored, edited and published two multi-author books. I've edited and published four books for other authors. I'm currently working on three more books that will be published later this year. All in the last six years. What changed??? What made it possible for me to do all this in so short a time? Wonder how you could do it too? once I discovered the secret. And I'm going to let you in on that secret in just a bit. But first, let's get a few things straight. People write books for a lot of reasons. They write articles, blog posts and other materials for a lot of reasons. All these reasons are important and we'll talk more about them later. However, the most important reason for anyone in business (or corporate life or academia) is to become the recognized expert in your market so that clients seek you out and beg to work with you. Writing creates the aura of expertise, writing makes it possible for you to get found on the Internet (and if you're not there, you might as well not exist). Your writing skills matter too. 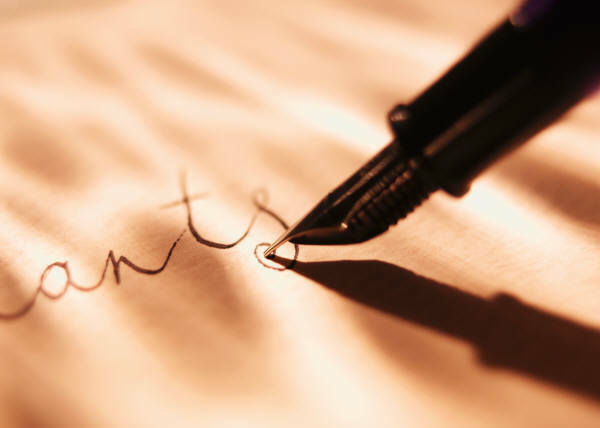 The way you write gives your business a professional aura that is difficult to establish in any other way (or it can give you a sloppy reputation that is almost impossible to erase). If not, you will fail. The result is predictable. Most people give up before they ever start. That book, those articles, that blog that is so important to your success never gets written and your business languishes. That book that will make you the recognized expert in your market stays in the "future." That blog never gets started. Those articles remain stuck in your head. Take a deep breath and pay close attention. Even pros face these same scary moments! After 15 years as a newspaper editor, I thought I was pretty hot stuff. After all, you have to be good to win the California Newspaper Publishers Association award for Best Newspaper in California three years in a row. I was a damn good writer and editor and thought I knew it all. Then the recession of the early ‘80s hit and the newspaper darn near went out of business. I was given a stark choice: get laid off or take a job in accounting. I was pretty good with numbers and needed to keep food on the table so I gratefully moved over to accounting and eventually became chief financial officer. Before I went to bed, I typed that first page into the computer. Every night for the next six weeks, I came home, sat down at the computer and punched the keys for two to three hours. The words flowed, creating chapter after chapter. When I finally printed it out, it ran to two inches thick and 600-pages! I was shocked and devastated. For days I stared at the computer, unable to write. The words that had flowed so freely stopped dead. Finally I picked up the manuscript and read a few pages. Something WAS wrong and I didn’t have a clue as what it was. I tried to fix it. In fact, I was so determined that I wrote and rewrote and rewrote, for months, for years, and it still wasn’t fixed. I attended writer’s conferences, got tips here and there but nothing worked. I was about ready to give up and resign myself to doing that distasteful accounting job for the rest of my career. Are You At a Crossroads Like This? Are you, especially if you are a coach, consultant, professional, or business owner, up at night facing that awful choice: give up your dream career or go broke? In today's highly competitive market, as more and more of us chase fewer and fewer clients, that stark choice looms: Find a salaried job to put food on the table or desperately scramble for a way to stand out from that crowd of competitors and attract the clients you need to succeed. Take a moment, put aside your worries, and look into the future with me. you get calls from people demanding to be YOUR client. Instead of ignoring you, reporters call to interview you about your business. Your professional association invites you to speak at its next convention. These aren't dreams. They're everyday reality for thousands of business owners, professionals, coaches and consultants. It doesn't matter if the economy is racing in high gear or if it's falling on its face. Businesses that stand out get first claim on the available clients and customers, leaving everyone else to scramble after the leftovers. They're different because they use the single most effective way to stand out from the crowd. It's simple: When you write well, whether it's books, articles, or marketing materials, you become the expert. And people buy from experts! I didn't always know this. In fact, for many years I watched the small companies I worked for fail to get new customers and wondered why. I saw them lose money and wondered how to change that. The answer was right under my nose and I never saw it. Remember my crossroads? That discouraging moment when all seemed lost? At that moment of deepest frustration, my mentor showed up. You see, I needed help but I needed it from a mentor who had the big picture, who knew the ins and outs, the secrets most writers and business owners will never learn. I found that mentor because I was willing to reach out for help twice, first by taking a ten-week course in writing dialogue at UC Irvine, second to joining an expensive elite seminar led by --- my new mentor. His name is Sol Stein. He owned the New York publishing house Stein & Day for decades. He came out from New York every winter for ten weeks and over the next four years, sitting in his living room in Laguna Beach, California with 15 other writers, I learned how to write and edit fiction, how to write non-fiction, how to create characters, plot, suspense, and story lessons. He edited parts of two novels, used one of my scenes in a video called Stein on Writing, and taught me how the publishing business works. Those four years with my mentor changed my life. Not at first but ultimately, as the chief financial officer job started to fade, when I again faced the choice of getting another job or going out on my own, I discovered the key to attracting new clients. Who would guess that volunteering to head a committee and risking money I never intended to risk would lead to professionals paying me thousands of dollars to publish their books? Not me, with two unpublished novels on the shelf and a job as a Chief Financial Officer taking up most of my time. Eight years ago, in a desperate effort to turn my career towards my dream of writing books, I joined Professional Coaches and Mentors as a writing coach but knew little about how to actually publish a book. For three years not much happened. I picked up a few clients and made a few bucks, but not enough to quit the day job. In a truly dark moment, when I thought I’d have to give up my dream, I heard a rumor. Someone had proposed that PCMA publish a book, a collection of articles by members. I volunteered to head the committee. Now, as I said, I knew nothing about publishing books. I could have fallen flat on my face with embarrassing results. About halfway through the process it seemed like that might happen. The book had to be done for the annual conference in March and by December I’d just finished choosing the articles. And the national board was reluctant to budget any money for printing. By February I had the book ready but still no money. As time counted down I made a decision: Risk my own money to print the book and hope for the best. The first day of the conference dawned. We set out the freshly printed books in the book store and waited. Two days later, the books were all gone. 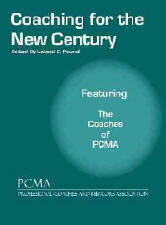 Coaching for the New Century was the best-selling book ever at a PCMA conference. I was suddenly a hero. Doors opened. Suddenly I stood out from the crowd of coaches. I served several years on the conference committee. I got editing and coaching jobs from members of the association, some of which continue to this day. The book has been selected as a textbook in college coaching classes and still sells from the PCMA web site. And as a side benefit, I now owned a publishing company that I'd set up just to publish that volunteer book project. I followed the same procedure to publish my two novels, then wrote a book on writing. Along the way I picked up editing clients, then got asked to publish other people’s books. Today, I have ten book projects worth thousands of dollars under way with many more to come. I learned that the best way to succeed is to take action to make my dreams happen. I became a publishing expert because I finally finally applied (years later) what I learned from my mentor by publishing my own books. Don't wait like I did. Make your dream of being the expert in your market come true by taking action now to get the ongoing support you need to write your book. I learned about commercial publishers and met literary agents. I discovered vanity presses and avoided them at all costs. I discovered self-publishing along with the myriad of programs, editors, publishers, and coaches who supported that industry. I discovered that it didn't cost a fortune to publish my books. I discovered that it was easy to set up my own publishing house. I learned how to design books and covers and how to find printers. Today I am a writer, novelist, editor, speaker and publisher. I've worked as a chief financial officer in the publishing business so I have faced the same business challenges many of you have faced. I became co-producer of the phenomenally successful seminar company, Speak Your Way to Wealth, which has attracted speakers like Mark Victor Hansen, Joel Bauer, Eric Lofholm, Adam Urbanski, Dave Lakhani, Ken Foster, and many others. I've written and published seven books and counting. Through Solutions Press I have edited and published authors writing about subjects ranging from management and leadership to sales strategies. And most important, I learned that the skills I learned by writing novels and non-fiction books also apply to writing powerful marketing materials that sell your products and services. "...took my book to a whole new level of professionalism." I want to acknowledge and thank you for the enormous contribution you made to my new book, Unshackled Leadership. While the previous edition had also been professionally edited and I sent the new manuscript to you for what I thought would be some "fine tuning," what you did was so much more. As a result of your editing, the book know reads in a way I can be truly proud of. I have also implemented all of the suggestions you made which took the book up to a whole new level of professionalism. You clearly know your stuff and I happily recommend your services to anyone wanting first class editing. Today I am living my dream because I reached out for help, because I invested time and money in my mentor, because I took risks when I needed to, because I studied my craft and applied it. People unconsciously associate publishing books and articles with expertise. People automatically assume that the writer must be different from the rest of us, must be better at what they do, must know more than us, must be more trustworthy and must be THE EXPERT. Successful professionals know this. They write to separate themselves from the crowd. They do it deliberately. Anyone can write a book or an article. Anyone can become an expert in their market. Anyone. You just have to know how to do it. And the good news is, you can learn these skills, just like I did. Think back to the last service club or professional meeting you attended. What attracted you to that meeting? Certainly not the business part. The published author who was speaking attracted you, the professional who promised to give you new information that you needed, who promised to inspire you. Maybe you even bought the book at the end of the meeting. That author/speaker had one purpose for appearing at that meeting. He or she didn't get paid to speak and doesn't make money off selling the book. That speaker wants to convince you to become a client. The book is the marketing tool that makes this happen! By writing the book, they've learned to write other marketing materials in a way that attracts potential clients and persuades them to buy your products and services. Such authors are just like you. They started in the same place you did. They don't know that much more than you. However, they've done one thing very few in their market have done. They've tweaked their marketing strategy by writing quality books that attract clients and customers, a powerful technique that gives them instant celebrity status, makes them stand out from the crowd and creates the instant perception that they are the go-to experts in their markets. There is nothing preventing you from doing exactly the same thing. You are standing on stage, holding your book, absorbing the applause as you finish your speech. You are standing at a table at the back of the room, your books spread out on the table, a line of eager fans holding out their credit cards, eager to buy your book. And some of them ask how they can work with YOU. You are in a meeting in a potential client's executive office. On the desk you see a flyer from one of your competitors. You smile as you hand the potential client a copy of your book. He or she pages thoughtfully through it, looks up and says, "When shall we begin?" You get an email from Amazon.com requesting more copies of your book. The current supply has sold out. YOU are now the recognized expert in your market. So why don't more people write? There are a lot of book programs out there. Who do I trust? It costs thousands of dollars to get published. I hear so much contradictory information. Where do I start? They all want to get my money and control my book. I have no idea whether my writing is any good. I started in the same place. I had many of the same excuses. Granted, I'd been a newspaper editor for years. But write a book? That was a dream that had lurked in the back of my mind for decades. And I was no better than anyone else at getting that book out of my head and onto paper. Now that I know how to write and publish books, I want to share that knowledge with you. My goal is to help you break through the negative thinking so many people have about writing, to show you how false those beliefs about writing are. and it won't cost you a fortune. I too have an expensive book publishing program. I coach authors one on one and edit and publish books for them through Solutions Press, my publishing company. Because of the time involved, I limit the few projects I take on to less than 10 a year and charge thousands of dollars. I have a waiting list for whatever spots open up from time to time. I've included testimonials from a few of my clients in this section so you see what they say about working with me. However, my goal is to reach a far larger number of people than I can reach working one on one. Looking back, it's clear to me that working with my mentor, Sol Stein, made everything that followed possible. That's why I decided to set up a mentoring program in addition to my book publishing business. Lee helped me publish my first book, Precision Selling: 21 Winning Strategies to Achieve Peak Performance. Not only did he give me some terrific advice, he did my editing, proofreading, publishing, and was the guiding force behind the entire process. I've hired him to edit and publish my second book. If you want to publish a book, this is the guy to hire! My Writing Excellence Group Coaching Program will help you cut through the hype in the marketplace and to give you straight answers to your questions. My first goal is to help you create a quality product that will represent you well in your market. My second goal is that you publish your book, articles and sales materials in the way that best suits you. My third goal is to give you powerful secrets and insights into the writing and publishing industry. The Writing Excellence Group Coaching Program allows many more authors to get high level coaching than I could ever reach through my publishing program. In addition, many of my current publishing program authors also participate in the Group Coaching Program calls so you will hear and benefit from some of the high level coaching I give them. Finally, this is my way to encourage you to stay in the conversation about writing and publishing long term, to continue inspiring you to write and publish, and to reinforce the information you need to be successful in your writing and in your business. Why a new writer can feel exhausted after just a few hours of writing and what you can do about it. The Writing Excellence Group Coaching Program will give you the same accountability, ongoing support, and mentoring in a committed community of writers that you can only get from far more expensive programs. My clients tell me they have learned how to write a book effectively, how to use stories to create emotional impact, and how to publish and sell their books. I will teach you the same powerful techniques. Every Monday at 4 p.m. you will join me on a conference call where we will discuss a wide range of topics related to writing skills, persuasive techniques, publishing, editing, storytelling, and speaking to sell your book. Each session is packed with useful information you can use immediately. During the call, you can ask questions and will get immediate personal coaching. All call recordings are posted on a secure web site for protégé members only. You as a member will receive a password and can access the calls anytime you wish. Over 80 hours of recordings are available there now. I'll even post other items from time to time that I believe will help you grow as a writer. These might include interviews on writing or storytelling, speeches I've given on subjects related to growing your business, or e-books with important information you need to know. You will learn the writing and publishing process from A to Z. Through this program, you will learn how to start your book, how to write it, how to promote it, how to use stories effectively, how to publish your book, how to write articles and marketing materials, in short, how to make yourself the expert in your market. You will get coaching on request on the calls. You will be able to ask questions and get immediate answers. "... helped bring my presentation to life..."
"I recently asked Lee Pound to help me with a speech I was giving for our company convention. An associate of mine had recommended him because of his expertise in storytelling. I not only received help presenting my stories, but Mr. Pound recommended ways of improving my entire speech from start to finish. He helped bring my presentation to life with the addition of voice inflection, gestures and the knack for knowing just when to pause and just when to punch. He found words that could be eliminated, honing my message sharply. And he presented ideas for adding more descriptive phrases that brought my word images to life. Lee gave me the confidence to deliver my speech before an enthusiastic audience, with great success. Because of him, I was able to truly connect with my listeners." When you join the Writing Excellence Group Coaching Program, you get the same mentoring I gratefully accepted from Sol Stein, the same mentoring that changed my life forever. Are you willing to admit you need help with writing, just as I admitted I needed help? Think about how many years you've thought about starting your book or using writing to market yourself but never did it because life got in the way. Think about how tired you are of seeing a competitor hand you the book they just wrote and thinking to yourself, "Why don't I have the discipline to write my book?" Isn't it time to say, "Yes, give me the tools to write powerful books and articles."? If you never write that book or those articles or sales materials, in the end what will you have to show for your lifetime of expertise? Imagine how neat it would be to have your grandchild give your book to a friend a college and say, "Look at what my grandpa (or grandma) wrote!" Great writers always get feedback and coaching from their colleagues. Athletes like Tiger Woods and business leaders like Donald Trump have coaches and mentors to make sure they become successful and to maintain that success. Even those with natural talent need help to make it to the next level and create the change they want to see. Make a minimal investment in yourself and become part of a community that will help you ensure that at this time next year you are the one proudly handing out copies of your book, writing articles, blogs and letters that sell your services. Here’s the deal: I don’t have the time to individually coach hundreds of people through writing a book. Those few I do coach pay thousands of dollars for personal access to me. And I don’t accept just anybody. With this package, for one hour every week you get personal access to me. You get the help and mentoring you need to write books and articles that attract customers NOW. Imagine being able to ask your most pressing questions about writing and publishing and get answers immediately. I’ll be there every week just for you. With the weekly coaching and accountability you get, you’ll stop wasting precious time. You will write and publish your book and articles and be hailed as the new expert in your market in record time. As I said, I charge $250 per hour for private coaching. If I coached you for one hour per week for 52 weeks, you’d pay $13,000 per year and it would be a bargain. That's fine for those who have $13,000 to spend and who I accept for full personal coaching. But, I thought, what about everyone else? How could I take care of the hundreds or thousands of people who desperately need this information but who I can't fit into my already tight schedule? Then it hit me. What if I dedicated one hour per week to sharing my best insights on writing and publishing with not one but dozens or hundreds of people at once by teleseminar? I would only have to spend an hour a week plus prep time and I could reach lots of people at once. Which gives you an incredible opportunity. You get me live on the phone once a week and for half an hour for anyone who cares to ask I will coach you and answer your questions. And because a lot of you are on the line, I can give you an incredible deal. You win. I win. Every bit of this incredible life-changing information can be yours, and not for over $1,000 per month. It can be yours for just $397 for a one year membership. For that you get access to all the weekly calls for a full year AND you can listen to and download all past calls, which means you get instant information you can use to start writing NOW. That's about $8 per call. And you get access to all my best information and insights into the world of writing and publishing every week. One hour of the finest coaching in writing skills you will find anywhere! Listen to the training and download all the past calls during the first month of your membership. If at the end of 30 days, you decide this is not for you, just let me know. You'll owe nothing and we'll part friends. Here’s what you do: Click on the green button and fill out the short order form. You’ll get an email with your access codes, phone numbers and the password to my secret archive files. Then just dial in and start learning how to write a book. Download the files, listen to them, put the techniques I teach to work for you. If you decide it’s not for you, just let me know before the 30 days are up and we’ll part friends. And you get to keep the downloads and everything you learned. What’s to lose? You risk nothing by trying the program. You get my best material and you get to use it for the rest of your life to generate powerful articles and books. Just click on the appropriate green button and let’s get started. See you on Monday’s call! PS: You can become the expert in your market easily just by writing books and articles and speaking to groups and organizations. Learn how to do so by clicking the box above. PSS: For about two cups of coffee, just $8 per week, you can learn the secrets to powerful marketing through writing and speaking that will bring you a flood of new customers.